"This Whole30® meal is packed with flavor and nutrient-rich ingredients and will surely curb your hunger!" Heat coconut oil in a heavy-bottomed skillet over medium-low heat until shimmering. Add chicken. Cook, tossing to avoid sticking and burning, until no longer pink in the center, about 7 minutes. Move chicken to a bowl. Combine onions, red bell pepper, jalapeno pepper, garlic, and ginger in the skillet. Cook and stir until vegetables are softened, about 7 minutes. Add sweet potato, plantain, and carrots. Cook, stirring occasionally, until slightly tender, about 5 minutes. 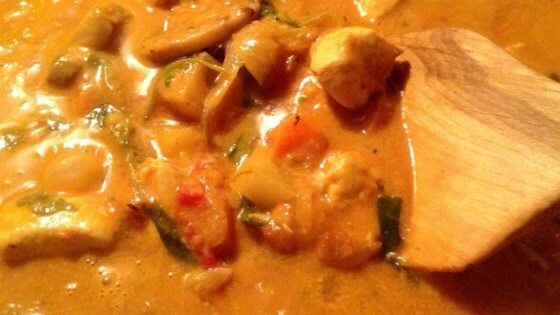 Pour coconut milk, tomatoes, and water into the vegetable mixture; stir to combine. Cook, covered, until flavors meld, about 30 minutes. Add kale, curry powder, salt, black pepper, and cilantro. Cook until sweet potatoes and carrots are soft, about 30 minutes more. Wow!!! So yummy! Did the prep work one evening after work, cooked this dish the next night and promptly refrigerated. Warmed up a serving this evening ... what a warm and tasty recipe! Outstanding! I will definitely be able to sneak this into our regular meals.